CNN and Fox News project majority for Democrats in the House of Representatives, while Republicans will keep their Senate majority. Democrats will take control of the House of Representatives for the first time in eight years, CNN and Fox News projected on Tuesday night, hours after US voters went to the polls for the 2018 midterm elections. Both networks projected that Republicans would keep the Senate, setting up a divided Congress until the 2020 elections. The latest results show Democrats with 221 seats in the House - an absolute majority in the 435-member chamber - compared to 199 for the GOP, with 26 net pickups for the Democrats. Republicans, on the other hand, flipped four seats in the Senate thus far, including incumbent Joe Donnelly's seat in Indiana, Bill Nelson's in Florida, Claire McCaskill's in Missouri, and Heidi Heitkamp's in North Dakota. The GOP retained seats in competitive races in Texas and Tennessee. One Republican Senate seat was lost, with incumbent Dean Heller losing to Jacky Rosen in Nevada. The race for the Republican-held Arizona seat and the Democratic-held seat in Montana remain too close to call. Mississippi, which held a jungle primary on Tuesday, will hold a runoff election on November 27th for a special senate election. Republican Cindy Hyde-Smith is heavily favored to win. The GOP is now projected to hold 52 seats in the 100-member Senate, compared to 45 for Democrats (including two Democrat-aligned independents), with 3 seats still to be called. With their win in the House, the Democrats will gain new power that will allow them to challenge President Donald Trump for the next two years of his presidency. Trump tweeted about the results shortly after 11:15 p.m. local time on Tuesday night. “Tremendous success tonight. Thank you to all!” he wrote. Trump was not expected to comment further on the election results as the White House had called a lid, meaning the president would not speak. The first polls closed at 6:00 p.m. EST (1:00 a.m. Israel time) in most of Indiana and Kentucky. Before Tuesday’s vote, Republicans held 51 seats in the Senate, compared to 49 controlled by Democrats. These include two independents who caucus with the Democratic Party. Of those seats, 35 were up for grabs. According to Fox News, 19 of these seats will likely remain Democrat, and another five that will likely remain Republican. Additionally, there are three seats that lean Democrat and three seats that lean Republican. Arutz Sheva will be posting live updates on this page throughout the night. All times posted are Eastern Standard Time. Fox News projects that Republicans will retain control of the United States Senate. Although the exact size of the GOP majority is not yet known, a Republican Senate allows President Trump to continue shaping the federal judiciary, including possibly the Supreme Court, and provides a check against House Democrats who want to investigate and perhaps even impeach the president. Republican Senator Ted Cruz has defeated Democrat Beto O'Rourke in Texas, according to several media projections. CNN is projecting that former Massachusetts Gov. Mitt Romney will win the US Senate race in Utah, replacing Orrin Hatch who retired. Democrats have picked up four more seats in the House, CNN can project, with wins in Kansas, Pennsylvania, Minnesota and New York. Democrats now need to pick up 11 Republican-held seats to win the House majority. Democrats must now pick up 15 Republican-held seats to win the majority. Democrats will retake control of the House of Representatives, Fox News projects. Republican Mike Braun will defeat Democratic Sen. Joe Donnelly in Indiana, CNN projects. As of this time, the Republicans have won 82 seats in the House of Representatives, and the Democrats 76. In the Senate, Republicans have so far won 32 seats and Democrats 36. Democrat Bob Menendez has won reelection to the Senate in New Jersey, projects The Associated Press. The polls have closed in 14 more states: Arizona, Colorado, Kansas, Louisiana, Michigan, Nebraska, New Mexico, New York, North Dakota, South Dakota, Texas, Wisconsin and Wyoming. CNN has projected three governor's races in Tennessee, Arkansas and Rhode Island. Michigan Democrat Rashida Tlaib and Minnesota Democrat Ilhan Omar would be the nation's first Muslim women in Congress, according to CNN. Polls have closed in Arkansas. Democratic candidate Donna Shalala has defeated Republican Maria Elvira Salaza in Florida’s 27th district. In Connecticut, Democratic Sen. Chris Murphy will win a second term by defeating Republican Matthew Corey. Democratic Sen. Elizabeth Warren, of Massachusetts, is projected to win a second term in the Senate, defeating Republican state lawmaker Geoff Diehl. In Pennsylvania, Democratic Sen. Bob Casey will win a third term to defeat Republican Rep. Lou Barletta. In Maryland, Democratic Sen. Ben Cardin will win a third term by defeating Republican educator Tony Campbell. In Maryland, Republican Governor Larry Hogan will win a second term by defeating Democrat Ben Jealous, the former president of the NAACP. Polls have closed in Alabama, Connecticut, Delaware, Florida, Illinois, Maine, Maryland, Massachusetts, Mississippi, Missouri, New Hampshire, New Jersey, Oklahoma, Pennsylvania, Rhode Island and Tennessee. 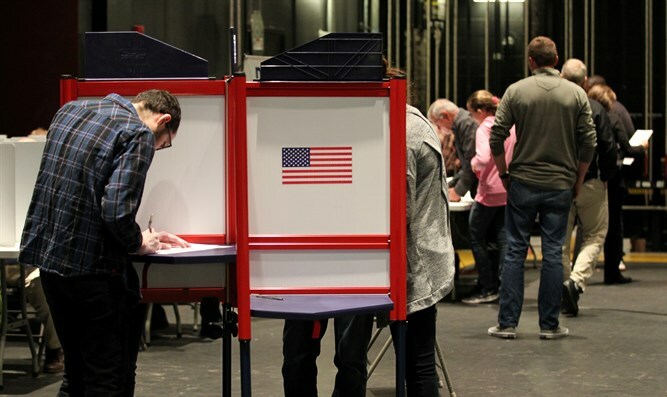 In addition, polls closed in some parts of Kansas, Michigan and Texas. Republican Rep. Barbara Comstock will be ousted from her northern Virginia seat by Democratic state Sen. Jennifer Wexton, CNN projects. Comstock's district in the Washington suburbs was seen as a must-win by Democrats in their bid to make a net gain of 23 seats and take control of the House. Polls have closed in North Carolina, Ohio and West Virginia. Greg Pence, the older brother of Vice President Mike Pence, will win the vice president's former congressional seat in Indiana, CNN projects. Pence was elected in the deep-red 6th District to replace former Rep. Luke Messer, who vacated the seat in a failed bid for the Republican Senate nomination. Fox News projects that Independent Senator Bernie Sanders will easily win a third term, defeating Republican Lawrence Zupan. Polls have closed in most of Florida, as well as in Georgia, Indiana, Kentucky, South Carolina, Vermont and Virginia. Virginia Sen. Tim Kaine will win reelection, CNN projects, defeating Republican challenger Corey Stewart.